Frances Perkins, the first woman appointed to a cabinet post in the U.S. government, had an impressive resumé before becoming Franklin D. Roosevelt’s secretary of labor in 1933. In 1910, armed with a degree in social economics, she became executive secretary of the Consumer League of New York, through which she improved the wages and working conditions of women and children. She moved through a succession of public service jobs and in 1929 was named industrial commissioner of New York State. Perkins was a strong proponent of government management of fiscal policy and of the redistribution of wealth to support social insurance programs. She was a key figure in the “brain trust” that implemented the New Deal policies of the Roosevelt administration. Her record of accomplishment during her twelve-year tenure as secretary of labor is remarkable: she pushed for, and got, legislation on a minimum wage, a maximum work week, unemployment compensation, the abolition of child labor, and a public works program. She co-drafted the Social Security Act and Fair Labor Standards Act. She continued to work under the Truman administration as civil service commissioner, resigning in 1953. Her later years were occupied with teaching at Cornell University. Unknown artist. 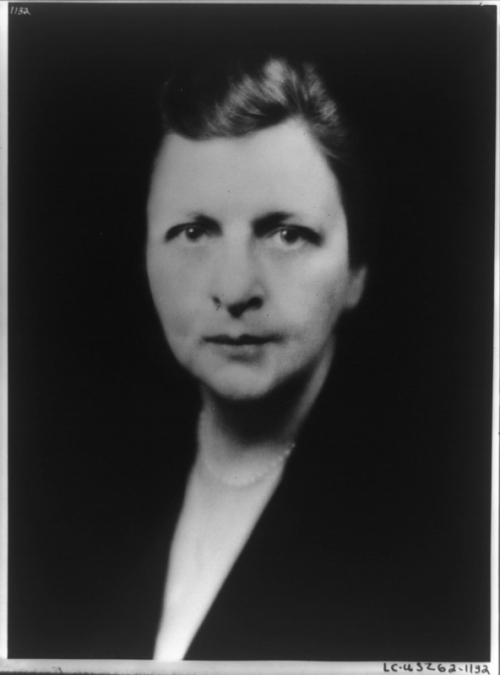 Frances Perkins, 1932. Library of Congress, Prints and Photographs Division, Washington, D.C.